prepare a short list of key papers/books and background readings in your area and method – these will be used to do a collaborative mapping of interdisciplinary approaches to miscommunication. We will also ask everyone to present some ideas for future work at the end of the day – but in collaboration with one other person, so no real need to prepare for that, but if you have some thoughts, data or ideas about future work on miscommunication you might want to bring some materials you can show. We are not asking for formal presentation – we are trying to avoid those for the colloquium and instead focus on collaboration. 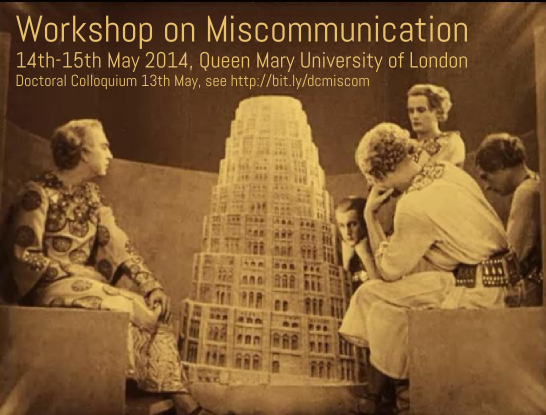 We will prepare a series of core questions on miscommunication for a plenary session at which the workshop participants will be invited to respond. We will each work together with one other doctoral colloquium member to write a short, immediate response (on our blog) to one of the presentations to go along with the video archive that will put the presentation in a bit of context and help to link them together.